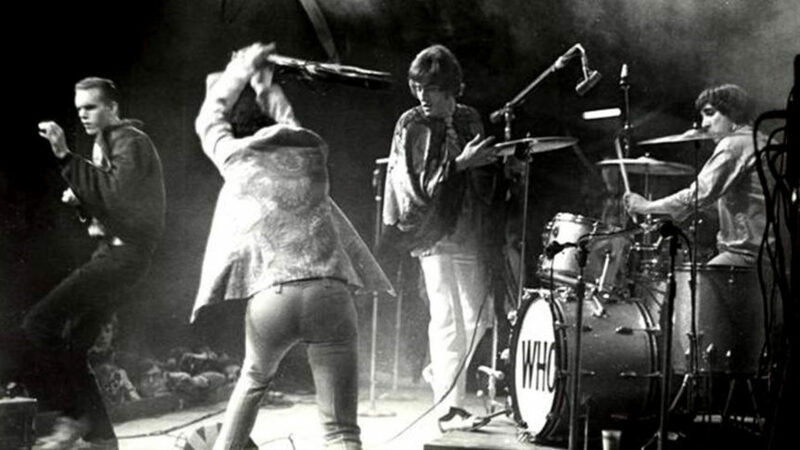 The Who developed from an earlier group, the Detours, and established themselves as part of the pop art and mod movements, featuring auto-destructive art by destroying guitars and drums on stage. Their first single as the Who, “I Can’t Explain”, reached the UK top ten, followed by a string of singles including “My Generation”, “Substitute” and “Happy Jack”. In 1967, they performed at the Monterey Pop Festival and released the US top ten single “I Can See for Miles”, while touring extensively. The group’s fourth album, 1969’s rock opera Tommy, included the single “Pinball Wizard” and was a critical and commercial success. Live appearances at Woodstock and the Isle of Wight Festival, along with the live album Live at Leeds, cemented their reputation as a respected rock act. With their success came increased pressure on lead songwriter and visionary Townshend, and the follow-up to Tommy, Lifehouse, was abandoned. Songs from the project made up 1971’s Who’s Next, which included the hit “Won’t Get Fooled Again”. The group released the album Quadrophenia in 1973 as a celebration of their mod roots, and oversaw the film adaptation of Tommy in 1975. They continued to tour to large audiences before semi-retiring from live performances at the end of 1976. The release of Who Are You in 1978 was overshadowed by the death of Moon shortly after.